Why do many plants produce flowers that vary in how much benefit they offer pollinators? Why do many of those plants tell pollinators which flowers are more rewarding than others? Is it better to put your cards on the table or keep them close to your chest? If you look at different plant species, you can find a whole spectrum, from species that hide their floral rewards, forcing pollinators to climb into each flower in order to find out what’s there, to species that provide conspicuous cues indicating which flowers are likely to be rewarding and which are not. We are curious about what drives this variation: what are the benefits and costs of providing information about floral rewards to pollinators? You might think that pollinators would prefer plants that gave them as much information as possible, since that information could save them from wasting a lot of time exploring flowers with inferior rewards. Being preferred by pollinators could, in turn, provide an advantage to plants that provided more information, favoring the evolution of more open and honest communication between plants and their pollinators. 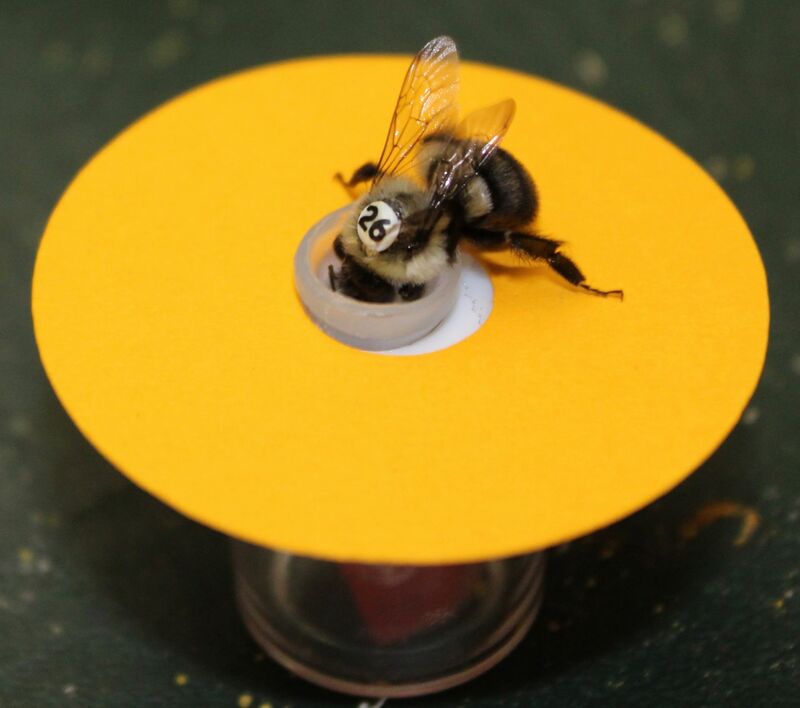 Prior to coming to Bates, Prof. Essenberg worked with a group of undergraduate students to test whether bumblebees would form preferences for a plant species that offered the bees information about which of its flowers were rewarding over one that did not. The group used artificial flowers in the laboratory, which allowed easy control over floral cues and rewards, and used flower size, which is often correlated with floral reward quality in nature, to provide information about floral rewards. In one of our two flower “species,” large flowers offered rewards and small flowers did not. In the other species, flowers varied in size, but large flowers were no more likely to be rewarding than small ones. The bees learned to prefer large flowers over small ones in the species where flower size actually gave them information about floral rewards and learned not to have a size preference in the other species. However, they did not learn to prefer the species that offered them information about which of its flower were rewarding. These results suggest that flower size as a reward cue is beneficial to the pollinators, but it is still unclear what benefit, if any, it provides to the plants. Essenberg, C. J., R. A. Easter*, R. A. Simmons*, and D. R. Papaj. 2015. The value of information in floral cues: bumblebee learning of floral size cues. Behavioral Ecology 26(5): 1335-1344. Bates students Paige Guevarra, Hadley Moreau, Cody Jordan, and Talia Zisman worked with Prof. Essenberg to explore how cues identifying unrewarding flowers could influence bees’ interactions with individual plants. We found that even when bumblebees had been trained to avoid visiting small flowers, those flowers could still contribute to the attractiveness of a plant. In addition, small, unrewarding flowers in our experiment encouraged bees to move to a new plant more quickly than large, unrewarding flowers did, suggesting that providing a cue to help pollinators discriminate against unrewarding flowers could benefit a plant by reducing within-plant pollen movement. We are also starting to move our research into the field. 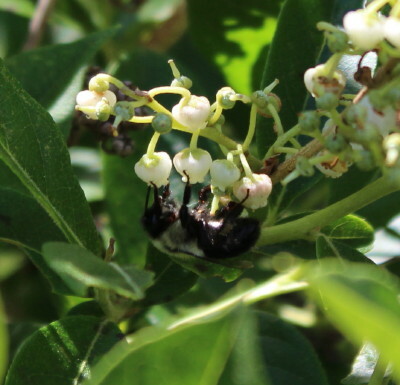 Thus far, we have learned that flower size of the local shrub maleberry (Lyonia ligustrina) gives information about nectar production rates, and preliminary data suggest that flower size in blueberries (Vaccinium angustifolium) may do so as well. We look forward to learning more about how flower size cues influence pollination of these and other local plant species. If you are a Bates student and find these questions interesting, please contact Prof. Essenberg about research opportunities in her lab.